Iku Sakan's background has led to a crystalline sound that is one-part club-ready beat and two-parts inflammable trance: circular rhythms twisting into luminous knots. Steel drums, king cobras, and Georges Bataille: No, this isn't a game of Clue ending with death by percussion, in a Caribbean zoo, by a French intellectual. These are, however, telling clues behind Iku Sakan's hypnotic electronic music full of percolating beats through glassy modulations. Before developing his dreamy carbonated sound, Sakan spent his formative years performing as a DJ in Osaka and Kyoto, Japan, wandering the shadows of the city's nightlife. As an outsider among outsiders, Sakan wanted a music community which could both challenge and support his music passion; he found it in 2009, moving to Berlin, Germany, to pursue his craft. A year after relocating, Sakan began playing steel drum at the Görlizer Park in Berlin. Gradually progressing from dance music to acoustic improvisations, he immersed himself in Berlin's avant-garde music scene for nearly a decade. Sakan eventually returned to Osaka in May 2017. But his travels are far from over as he already plans on traveling back to Berlin soon. 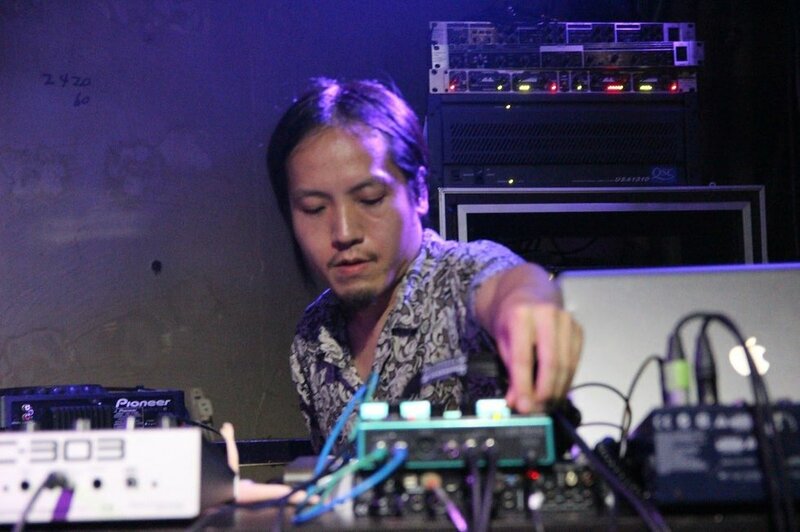 Although Osakan artists often lack the attention or the funds enjoyed by artists in Tokyo or Berlin, Osaka's music scene remains resilient and diverse, ranging from harsh noise to ambient electronica, from psychedelic rock to outright pop. Navigating somewhere through these contrasting sound worlds, Sakan has already had the good fortune of collaborating with some notable musicians within the international scene, including Muneomi Senju from deep space voyagers Boredoms, Damo Suzuki from krautrock mavericks Can, and Tori Kudo from wabi-sabi ensemble Maher Shalal Hash Baz. Sakan's extensive background of performing and DJing, while touring and collaborating, eventually led to a crystalline sound that is one-part club-ready beat and two-parts inflammable trance: circular rhythms twisting into luminous knots. His creative process is equally freewheeling, playing analogue and digital devices alongside pre-recorded materials, then merging the signals through mixers and FX pedals. Preferring the freedom of long-form recordings, Sakan teases out fleeting nuances in rhythm, melody, and timbre. Soothing as a winding creek, loops into fizzing patterns, dizzyingly dense, yet crystal clear. The first release in his 2017 trilogy, Cepheidian stands as a club-ready homage to Sakan's DJ background. The record models diverging visions of electronic music, pairing remixes from colleagues alongside two original tracks. E-Oma layers gaudy synths atop his remix of "Fibernation Pt. 1" while Jinge wanders through industrial dystopia. E-Oma's remix of "Sol Cry" floats in ethereal synths and hazy samples while Konokov's toys with ticking hi-hats and restless kick drum. In contrast, Sakan's own mixes sound even more alien when stripped of accents, left spinning like kinetic sculptures. Sakan's mature debut album, Human Wave Music perks past the pulse of Krautrock gone electronic within the depths of dub. Micro rhythms percolate, ebbing through oscillating harmonics which slowly accrete into stalactites dripping from cave ceilings. Drum machines maneuver melodies fusing an electronic palette to human instinct—synapse and circuit board mutually wooed. The effect is mesmerizing, like skating through an ice castle at dawn: every exhaled breath punctuates the air with CO2 speech balloons. The atmosphere sounds like an arctic landscape one should tread carefully with snowshoes. And yet, it feels warm as a summer breeze feathering the nape of the neck, triggering a dopamine rush in repeating waves. Whereas Human Wave Music nearly dissipates into airy minimalism, Prism in Us All swarms with visceral maximalism. The drum loops ripple through a subtropical haze, humming with caffeinated highs. Electronic melodies throb blissfully, playfully nudged into baffling patterns. Thick with humidity, one expects a waiter to approach with a silver tray, offering Tiki drinks in half-shelled coconuts. Lost inside a postcard fantasy, swaying beneath palm trees on a beach, it's a view best seen with one's eyes closed: birdcall ricochets through canopies; sunlight twinkles on white sand; and by dusk, a neon glow saturates the horizon. 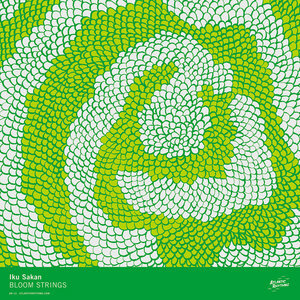 Surging with lysergic urgency, Sakan's colorful summer 2018 release, Bloom Strings, belongs on blotter paper. The cover art hints at the music within: a radial design tapers to a pincher, echoing both snake scales and flower pedals—letting the listener decide whether Bloom Strings is meant to be plucked and savored or skirted for protection. Sibilant treble writhes above tectonic bass. Deliriously psychedelic, flanging waves ripple alongside clicking percussion, sweetly scented and lightly venomous. The brain is a complex instrument. Each day, a single person's central nervous system processes more information than all of the world's Wall Street stockbrokers combined—accomplished without a license or trading desk; not a single conscious thought; and no evidence of overtime. Impressive. Spanning the cleft between clefs, Iku Sakan makes soundtracks for neurotransmitters leaping across chasms. Whether DJing in late-night clubs, busking in parks with steel drums, or improvising electronic beats in a bedroom, his music is instinctual and true. It's a sound that he's grown into; a sound that will keep on growing. You recently spent nearly a decade living in Germany. What were you doing in Berlin, of all places? Did you move just to make music in an arts-oriented city? Yes, it was like a hop on a completely different timeline. It was actually a very natural move. I was working at the headquarters of a local supermarket for several years prior to my moving. All in all, it was an amazing environment and experience in my life, I had great colleagues and bosses, too, but since music been always my secret lover, I knew I have to find the loophole to get out and switch lanes. And I did. My main aim was start creating my own music in a totally different environment. I knew I already had some great musical references but had no idea how to use or combine them to create my own musical niche. I basically just rolled the dice, and it went well. When I moved to Berlin in 2009, I had some savings from my former job in Osaka, plus, luckily, and gratefully, all of my past apartments in Berlin were not that expensive. Living was kind of easy. Also, I knew a handful of DJ bars I could play at, on a semi-regular basis. The money wasn't that good, normally, but at least it helped me get by. I've moved here and there inside of the cities. While I was in Neukölln area for about three years, I started to get heavily involved in the local, yet very international, improvisation and experimental scene. I played a lot both solo and in live collaboration with others. I met so many people while hanging out at DIY venues and organizing events and concerts. Unfortunately, after I moved out of Neukölln, I didn't get to see most of these folks. But I'm still in touch with some of them. We are like classmates from the same school. If we see each other, it's all love. What did you learn from that experience, both musically and personally, about life and art? My experience in Berlin has made me a more mature person at a human level. This whole Berlin experience also helped me grow into a musically creative person. But the thing is, I never made it by myself. There were always some good friends encouraging me to push my envelope. By the way, my name, "Iku", means "grow" in Kanji. So, I keep growing, just as my dad named me when I was born. I cannot say much about life and art. I'm still learning. But I think I became more dedicated when it came to my own craft. And since I started taking my own music more seriously, I also started to think about how long I can keep reinventing myself as a creator of this musical niche. I never know how much time is left for me, but humans are mortal anyway. With the limited time we're given, we take some and leave some. Some stuff we leave here might inspire someone in the world to create something completely new and different. Or maybe not. At a local restaurant in Okinawa, Japan, May 2017. Photo: Anders Lauge Meldgaard. What is the current music scene like in Osaka? I cannot really tell. Besides a few good friends here, I've been pretty much disconnected from the local scene in Osaka. But it might be that there's no actual scene that exists anymore. As far as I know, it's very low key these days, and nowhere near to the crazy melting pot that the city once had in the '90s—back when the vintage Boredoms were popping, when both the live house and club scene were hot. But I'm from that era, so I might be biased. And how is it different from the scene in Tokyo, or Berlin? Obviously both Tokyo and Berlin are super international cities. And big—especially Tokyo. There's so many layers when it comes to the music scene, too. Both the musicians and audiences are very diverse. But Osaka is not so diverse. To me, it's more like a village. And this is meant neither as an insult, nor a compliment. Just objectively speaking, it has a strong communal vibe. Is there a strong interest in electronic music in Osaka? I don't know. Of course, there's always some nice people doing their thing. And some followers, too. But I don't know. It might need someone to take a stand and push the culture. Is there support for underground music? Absolutely none—as far as I know. But it might be that the wind of change has started blowing just recently. It needs further research. Musically, and perhaps also in some ways culturally, Japan can appear to a foreigner as a country of dynamic contrasts. On one side of its music spectrum is the syrupy sweetness of J-pop; on the other side of the spectrum is the noisy onslaughts of Keiji Haino. Although you exist as a musical outcast within the Osakan community, how has your outlook been informed, for better or for worse, by your environment? Creating music in any niche outside of mainstream pop music is still risky in Japanese society. Japanese people don't normally perceive you as a musician or as a productive member of society. As a result, it's only natural that the underground music communities became a sort of safety net for social outcasts. And even in those communities, I felt that some of us were deceived by others' narrow minded, overly polite mentalities. So, I was like, "I don't really care, I don't want to try to fit in to be cool." I became the outsider of outsiders. After years of being stuck in my situation, I felt that I had to cut myself from my country for a while. So, I moved to Germany. I had to stay away for years to distance myself from this love-hate relationship with my culture. I think it was necessary in order to mature as a human being, because I was so oppressed back in my 20s. I was fortunate enough to get through all of this, though, and succeeded in re-inventing myself as a musically creative person. Now I have finally started to rediscover my love for Osaka's local music community. Yeah, I'm a slow tortoise. I'm thinking of how I can give back to the music community here. They helped make me this way. Where do you find comfort, joy, and excitement within Japan's eclectic cultural rainbow? In my music. As Gary Bartz once said, "Music is my sanctuary." At the secret beach in Okinawa, Japan, May 2017. Photo: Anders Lauge Meldgaard. What was the first music instrument that you learned to play? I never learned any instruments until I started to play steel drum in a Berlin park. The steel drum is my first instrument. Or maybe the Vestax turntable was my actual first instrument—I learned how to play records in wrong speeds to discover different dimensions in sound. But it was all self-taught, of course. Can you explain the importance of percussion and drums in your music? I always loved listening to percussive elements in almost any sort of music I've listened to. Having a percussive drive in my electronic music is very natural. It just makes me feel good. I can vibe to it. And it doesn't necessarily need to have huge pumping bass drum or anything. Just adding a circular rhythmic feel creates a subtle uplifting mood. Then you can feel the vibe even if you put the music in the background at a lower volume. Where did your interest in circular rhythms come from: music, science, technology? Virtually every record I've listened to and collected: especially African, Latin, jazz, and, of course, house and techno, and all the sub-genres, and sub-sub-genres. But as long as we live in this modern day and age, I think these circular, or repetitive, rhythmic patterns are inescapable. It's literally everywhere in the world (including the Internet). It's even in our DNA. It's just a matter of how you utilize it as a part of the sound function. I created my version by referencing all the great records I've been listening to all of my life. And what is the relationship between melody and rhythm for you? Melody and rhythm embrace each other and merge into one. My music is like an amalgam of these two. When I'm recording my music, sometimes I picture an extend improvisation on an imaginary melodic percussive instrument. I totally get why people hear gamelan, steel drum, kalimba, etc. in my music. Also, melody and rhythm define musical substances to me. How you utilize these two elements within the texture can result in musical cohesion. Cohesion makes it more musical. And more than just a sound. That's been very important to me recently. Although only a single recording of yours has featured steel drum, Live @ U-MAN, the tone and texture of your electronic music seem to echo that of the steel drum, glowing with bright overtones, yet thick as a tropical breeze. When did you first start playing this instrument? I started to play steel drum back in June 2010. At first sight it was just instinctual—a rather casual affair. I had already bought the instrument from a local store, and it was a perfect sunny day. I wanted to go outside and try something new. Since my apartment back then was on the ground floor, at first, I played just around the corner. Like a baby step, I was still too shy. Then the guy upstairs said to me, "You should play in the park, because it sounds beautiful." So, I did. Or maybe he just got annoyed and wanted me to go away. Anyway, that was the start. By the way, it wasn't a real chromatic scale steel drum. It was more like a detuned steel drum with a flat shape. It only played a few notes. It was very easy to play while still sounding good musically. A percussion store in X-berg, called "Pulse-Percussions," was occasionally selling steel drums (which were made by a German guy, who, unfortunately, I never got to meet in person). All of them had a uniquely detuned pseudo gamelan-esque sound. I was fascinated. I just basically rolled with it as I kept playing, starting to get into the local and international improvisation and experimental music scene. And what importance does this instrument have for you? It might be that playing steel drums in the past few years has affected my basic sound preferences almost at a deep unconscious level. Looking back, it was a special instrument because it was my starting point in Berlin. At the very beginning, I just loved the sound of these uniquely detuned steel drums simply from the listener's perspective. I was basically playing around with it. That was everything I could do back then. But some people liked how I made different sounds from my pan and it made me motivated to explore more diverse sounds from an instrument. Then it started escalating. I started using two Beurer mini-electronic massagers to vibrate the whole pan, creating huge scraping sounds which reminded me of David Jackman's Organum, or the loudest part of Iannis Xenakis' "Persepolis" LP. Then I added AKG stereo contact mics to amplify the sound of pan noise. After that, my music style became more electronic. The setup for the show at Essen, Germany, July 2015. Photo: Sebastian Lehmann. You credit discovering the steel drums with helping to guide your current sound. But is there a certain moment in your mind that triggered a focus on circular rhythms? Ever since my teens, I've collected many different sound sources: toys, weird sound gadgets, and stuff like that. And one afternoon I found that Stéphane Shibatsuji-Perrin's electronic dolls went really well with my Ableton Live setup. I guess that was the start. I added a Roland MC-303 to create a circular rhythmic feel. It was almost like a miracle. I had no idea why no one had ever tried the combo yet. During your music career, you've wandered adventurously through genres. Your first two solo albums, Live @ U-Man, and the Japanese CD-R both featured noise-heavy improvisation: sparse banging and scraping of metallic object, closely mic'd for textural grit. The effect is abstract and disorientating. Your recent work, in contrast, as featured on Cepheidian, Human Wave Music, and Prism in Us All, is more measured and melodic. Do you think of these two styles as distinctly separate? Yes. But at the same time, it was a natural transition. These first two albums are definitely documenting my improv era and live musique concrète era (I used to call this style "Field recording Karaoke" because I used many modified field recordings and played my contact mic'd gadgets on the top of them). That was between 2010-2012. It was great practice, but after that, I slowly started getting bored. All of sudden it became super predictable. While starting to experiment with different combinations of gear and gadgets, one day I found the set-up which I now work with as a system. Then I started recording a lot of music between 2013-2016 which resulted in my three recent releases. Also, by the time my musical transition started, I met Anders Lauge Meldgaard through my old friend Munemi Senju, in April 2012. Anders was a different type of musician and composer than most of the people I knew in Berlin, yet he was funny and super open minded. We started exchanging music and hanging out in Berlin. He kind of inspired me to shift my musical style, too. How do you balance noise with beats, abstract improvisation with electronic compositions? I never think about it. I've been listening to tons of music since my teenage years, so it's just natural, and all of these musical references are still in me. I've been really into this clear kaleidoscopic sound scheme for a while now. But there's also some musique concrète types of music I've recorded prior to that. I might go back to making noisier music sometime in the future. Can you speak a little more about your transition from a noise aesthetic to a more dance-oriented electronic sound? First off, these two elements and influences were always in me. I started collecting records in 1997 at a time when I frequently went to Namba Bears, a live-house venue in Osaka [which is operated by Seiichi Yamamoto, a former member of the Japanese band, Boredoms] that has been known as a mecca of underground music since the 1980s, and at the same time hanging out at the drum 'n' bass party. I was a curious teen trying to explore as much music as possible. But when I look back at my younger days, even before I started making my own music, I think that somewhere in my mind I was thinking, "I'm digging into this music not for random reasons, but for music I'll be creating in the future—the music only Iku Sakan can create." Both electronic and organic sounds have been key factors ever since my earlier listening experiences. Although I was always interested in the noise aesthetic, I never intended to become a creator of "noise music" at all. It was just a practice. And I don't mean any disrespect to the creators of said genre. Since I started in the Berlin park as a non-trained improviser, I just had to go through the route without skipping any steps—going from completely acoustic to partially electronic to completely electronic. When first starting to play my steel drum eight years ago, I did whatever I could with my instruments and devices, and the international audiences of the Berlin scene seemed to appreciate what I was doing (and I appreciated them back, too). I guess that it was just a matter of time, my music was destined to progress. The more I played, I began realizing that there's not much left to do in the noise aesthetic, especially with the wall of sound type of production. And I don't want to feel bored when I'm making music. What were you experiencing at the time which guided your transition from highly textural, sparse, and sometimes abrasive, free improvisation to smooth and crystal clear, bubbling electronic music? Back in March 2012, when I got back from my first tour in Asia, I already felt the need to find a new sound scheme in order to keep myself motivated. During that time, I had a personal revelation, of sorts, which left me with a funny image in my mind about what else I could do with my music, "What would it sound like to make harsh noise by using only hi-fi and crystal clear, diamond-like sounds, instead of lo-fi sounds which had been the genre's method for ages?" Then I met Anders, and, at the same time, my dance music references slowly came back. I knew I had to move forward. And I can't forget about my early influence from the vintage Ricardo Villalobos productions. I cannot really say I'm a big fan of his current releases, but I was a huge fan of his music circa 2003-2008 (including his remix works). His production skill was undeniable. He had a Midas touch back then. It was super hi-fi (almost cubic), yet so organic without losing the physical functions of modern dance music. The man sampled Christian Vander and turned it into some transcending minimal music. That's the art of reference to me. Performing at Forestlimit nightclub, Tokyo, Japan, August 2017. Photo: Yuya Naritomi. As a DJ, you have had an opportunity to revise the work of others. Unfortunately, people can sometimes regard DJing as a lesser form of art, not understanding its possibilities. What are some of the rewards and challenges of Djing? I agree about your point. DJing is the art of reference. Though some people might not see it. As a music person who already has a mental musical database (or brain Discogs), when I find an unexpected combination of two records, it actually wakes me up in public situations. That's a rewarding moment for me. It's like a "chance meeting". Two records coming from different times and spaces, from different historical contexts and cultural backgrounds, surprisingly complimenting each other. It's always challenging when playing in public situations; you have to see the vibe, improvise with the vibe. It's a form of communication. You cannot be super indulgent. And how has DJing influenced your creative processes? DJing (and record collecting) definitely influenced what I'm doing now. I always use three to four different sound sources when making music. And since my music is all about mixing and merging different sound sources and signals, the whole aesthetic of DJing has been my main inspiration. While attending Karlheinz Stockhausen's last festival appearance in Japan, you had the opportunity to hand him a copy of your own CD-R (a collaborative project called Sakan & Senju with ex-Boredoms' Muneomi Senju). What interest do you have in Stockhausen's work? My main interest in his music is his electronic pieces. Hymnen and Telemusik are always my favorite listening experiences from his vast discography. 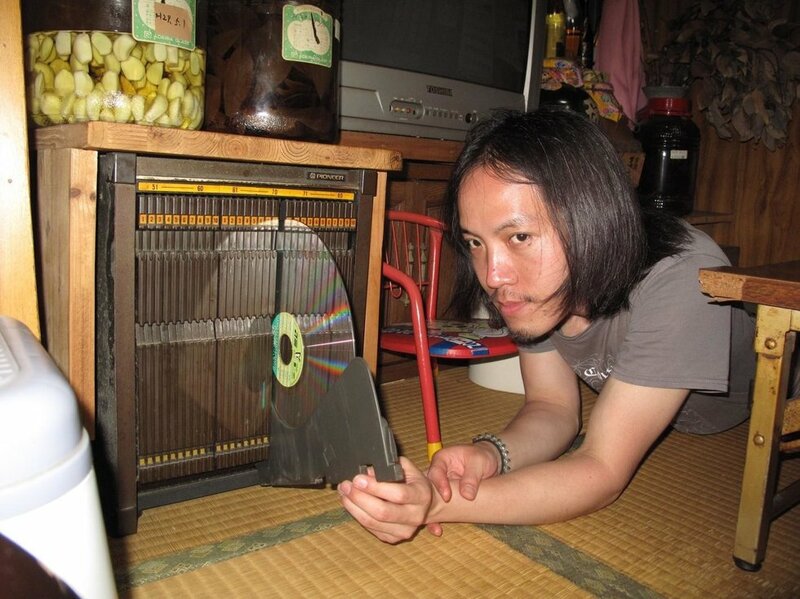 Also, as a curious youngin' during the '90s in Osaka, I was exploring contemporary music, noise, techno, and house music, all at the same time. If there were no ancestors like Stockhausen, there would be no techno or noise music. That's historically obvious. How has he inspired you? Listening to Stockhausen's work—especially his electronic compositions—in my 20s helped me to realize there's so much more to be explored in the realm of the sound sphere. But this also applies to many of his contemporaries from the 1950s-1980s. And did you ever hear back from him about what you thought of your album? Unfortunately, not. I don't really think he actually gave a listen to our super primitive, sonic child play. I was just a fan boy. I called Senju right after I left the concert hall, "Yo, Senju, I did it!" I was so hyped. I remember, after I handed him a CD-R, Stockhausen looked me in my eyes and said "I strongly recommend that you study composition." Was he kind of a prophet? I don't know. 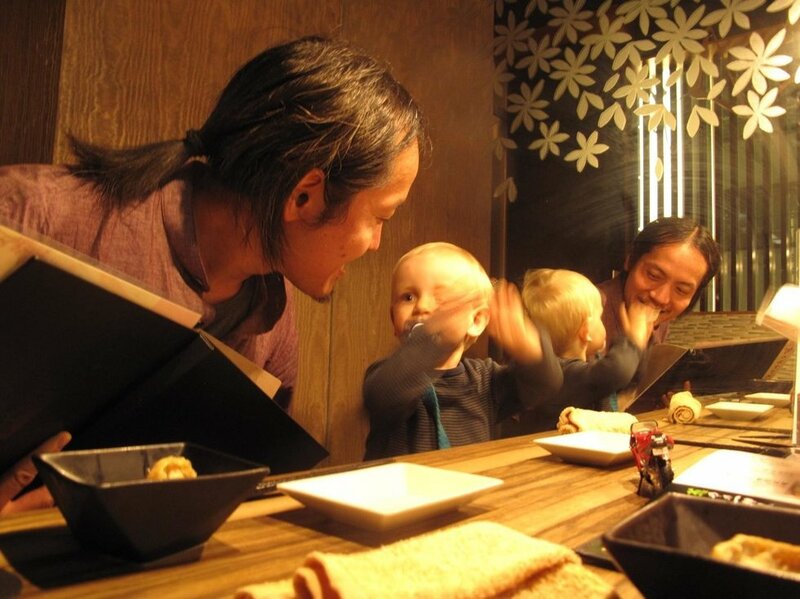 Eating with Holger, Anders Lauge Meldgaard's first son, at a restaurant in Ginza, Tokyo, May 2017. (Iku titled a track on Human Wave Music after Holger, in honor of the (then) two-year old's uplifting, lightful nature. Iku is curious to see how Holger will perceive this small gift from his Japanese uncle when he grows up.) Photo: Anders Lauge Meldgaard. Although you have just recently established your electronic style, you have already collaborated with distinguished artists across diverse genres—including namesakes like Sun Araw, Anders Lauge Meldgaard, Pekka Airaksinen, Günter Schickert, and Damo Suzuki. What are some of the surprises that you experienced while working with your collaborators? Technically, according to the musical experience, the Sun Araw Midi Octet that I participated in a few years ago (at Copenhagen Jazz Festival) was full of surprise. 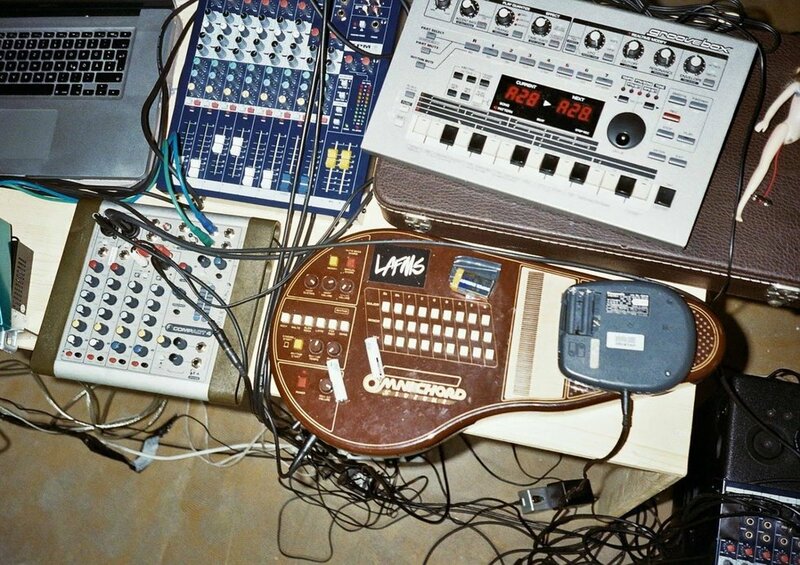 It's basically a system Cameron and his friend Sam Wolk invented together - centered around Yamaha TX 802 synth, Max/MSP, and Ableton Live—all players brought their midi-instrument (Anders Lauge Meldgaard curated Danish participants for the show btw), we all connected via TX 802. And thanks for Sam's Max/MSP wizardry, every single note we played affected other players' sounds. The outcome was a very unique electronic amalgam created by the live musicians. It was like a crazy game. Hopefully they keep doing this project with different constellations. Working with Anders Lauge Meldgaard is always full of pleasant surprises. He's kind of a renaissance type of talent. He plays various instruments, he composes for his string ensemble, builds his own instruments, and he even designed and built his own house. I think we also share a similar optimistic point of view when it comes to music. Speaking of Pekka Airaksinen, his whole existence surprises me every time we get to hang out. I've already visited him in Finland three times. It's like visiting your uncle—he's the same age group as my parents. He's such an interesting person with a unique philosophy. He deserves an autobiography. And his unreleased music wows me the most. Personally, I put him and Tori Kudo on the same pedestal. Both are one-of-a-kind musical human beings. Can you explain a little about what is unique about Pekka Airaksinen's philosophy? Oh, where should I start. It's so hard to explain. He's obviously a veteran from the Finnish avant-garde music scene of the 1960s. He's lived by himself in the middle of nowhere, in the countryside of Finland, for decades. And he's practiced Buddhism for many years. But he's not a pretentious person. He's modest, yet he has a wicked sense of humor. He once told me he'd avoided everything in order to focus on what he loves most—exploring both unique sonic aesthetics and the deep Buddhist stuff. He's the friendliest recluse you could ever imagine. The fact that a person could live in that way and still be such a creative person just amazes me. Last time I visited him, he played me a couple of his recent recordings. They were mind-boggling futuristic sounds. They are still ahead of our time. He's been just doing him—a creative and lovely human being. As the story goes, you met most naive musician Tori Kudo while playing steel drums in Matsuyama, Japan. How were you invited to play music with his freeform folk ensemble Maher Shalal Hash Baz? I first met Tori in Matsuyama city (where he lives nearby) in September 2010. I was at a tiny in-store concert organized by my friends. I was still playing my steel drum with an almost skeletal setup, and Tori was one of the few folks from the local music community (all lovely people) gathered around for the concert at a second-hand bookstore (it was at the upstairs of the old building—the downstairs was a coffee store). I was familiar with Maher's [Maher Shalal Hash Baz's] and Tori's name, but for some reason, I never listened to Maher's music till I met Tori. It was a rainy evening. I remember there were ambulances passing by outside of the building making beautiful Doppler effects while I was playing. I poured some water onto my steel drum, making some reverberating waterphone-esque sounds. And I also used rubber drum sticks, rubbing the surface of pan, making human voice-like noises. After my performance, Tori talked to me outside of the book store, I introduced myself and chatted for a bit. Tori seemed to be such a cool person. He said he liked what I did in the evening, and I was happy about it. The next evening, I was in Tori's car with a couple of my friends. Tori drove all night to get to Gifu prefecture where Maher was supposed to play at the open-air festival the following afternoon. I hopped on the car with my pan just expecting to hang out for a few days at the festival. While we were still on the way to the festival, my mobile phone received a group email for the Maher participants in the festival. It was more like an orchestra constellation. About 20 people were involved in it. Then I noticed my name was listed as their steel drum player for the festival. It was hilarious. And the rest is history. I was fortunate. Were there revelations working with an artist so spiritually "liberated" from the status quo? Most definitely. You don't have to be a technically virtuoso type to make good music. It's always about how unique and different your musical ideas are. That's what I got from him. If I hadn't met him at that distinct time in my life, I could be millions of miles away from what I'm doing now. He had a mentor role to me—whether he may disagree or not, he's my sensei forever. What were the results of your collaborations? In the short period of time (2010-2012) I participated with Maher as a steel drum player, we played at a few festivals like All Tomorrow's Parties in UK. That was an amazing experience. I also co-organized their first Berlin show in 2013 with my friend Markus (also known as DJ Shulcht). Probably that was a most fruitful result since I got to know Tori. Anders Lauge Meldgaard and I did an opening act for the night as duo. It was good. Have Tori and Pekka encouraged you to prioritize the power of music ideas over technical skill and spirit over mastery? Or something like that? Yeah, I think so. Knowing them in person helped cement my early, primitive concept about music creation (and it reflected my listening experiences, too)—the value of fresh and unique ideas over technical skills. For example, everybody knows of Thelonious Monk. But he wasn't actually a very skillful bop pianist compared to his contemporaries back then. He had his own unique musical ideas and had enough technique to realize them. That made his music really stand out. And how have your various collaborators inspired you to rethink your own music making processes or goals? This applies to all the names I mentioned above. They never judged me because I'm not a trained musician. They just see me as a musical person and appreciate my way of going. That's the type of people I want to be around. And more importantly, they all have unique musical ideas, and they know exactly how to realize their own ideas. New Year's Day portrait, Berlin, Germany, January 2018. Photo: Ryo Kosako. The liner notes of your first solo album, Cepheidian, reference a rather unique philosophical concept: "Cepheidians are the bulk of the universe, the foundation of any knowledge from the greater to the smaller. Temporal and local changes underlaid and still consistent in their spirit, they sweep through the universe and are the comparison and its resolution." Where did this concept come from? The concept of the record was actually not mine. My friend Adem Zor (also known as Shikoba) wrote that interplanetary—almost Sun Ra-esque—story. He had that whole concept for his label Planet Almanac. But whole notes on his tape were inspired by my music, so it was more like a collaborative effort between him and I. While we started discussing the release, we had a couple of nice Skype chats, which resulted in the title 'Cepheid-ian'—which could mean that some vibrational movements only exist or occur at a Cepheidian variable: the waves from the pulsating star where your imagination takes off. I did the sound and he came up with the back story. Do you read philosophy or metaphysics? I'm not gravitated to these. I tried to read some famous classics when I was younger, but they didn't speak to me much. I used to love me some [Georges] Bataille, though. Sometime I'd picked up one of his books, randomly open a page, and start reading from whatever lines I got caught on. I just love his writing. It's like reading a novel full of vivid imagery and quotations. It's very obscure and enigmatic even. What literary sources do you draw inspiration from? I used to read a lot of novels and short stories which, directly or indirectly, were under the influence of surrealism, and metafiction and such. Those type of books, once they click with you, work magic with your imagination, and help expand it. Marcel Duchamp's interview from 1966, with Pierre Cabbane, impressed me when I was younger. There are so many gems in it. And how, if in any way, do literary ideas inspire your own music making? Although I'm not reading books as often, compared to my teens and 20s, some lines from the books I read when I was younger still stick in my head and come back sometime even more vividly. One of them is André Pieyre de Mandiargues' old line from one of his short stories, "Love comes out from the future with a river noise, flows into the past, and washes it of all the existence stains from the past." If you could be any non-human creature for a day, joined by an artist from any medium of your choosing, regardless of whether the artist is alive or otherwise, which animal would you be and how would you spend a day with your artist companion? I'd be a poisonous snake, like a king cobra. And maybe I'd spend a day creeping in the shadow of the prepared piano of the young John Cage (still in his 30s, before he made 4'33", Cartridge Music, Rozart Mix, etc.). I would be thinking: How might the history of modern music change if I decided to jump out of the shadow right now and bite him? I know it's nothing but silly nonsense. And I mean no disrespect to Cage, either. But thinking about this impossible situation gives me great pleasure. What are your plans for the future? Are there any creative processes, software, or equipment that you'd like to explore next? I'm a polar opposite of "gear nerd" type, but I've been playing and recording with the same setup for the past five years, so I think it's time to start to switch up a bit. I've been recording my music only in my bedroom for a long time. But I'm going to start sharing the studio with friends here in Osaka this spring 2018. Sharing a music studio with others is still not super common in Japan. It's very rare. That could be the whole change of pace for my creative process. Do you have any special projects in mind? I've got four to five potential releases in the pipeline. One of them is the vinyl release of the virtually non-existent Sakan & Senju CD-R from 2005. We recorded it in 2003. So, after 15 years, it'll be out to the world. Sakan & Senju [the track "Green Journey" appears around 1:25:00] was definitely far more primitive in every way compared to what I'm doing now. 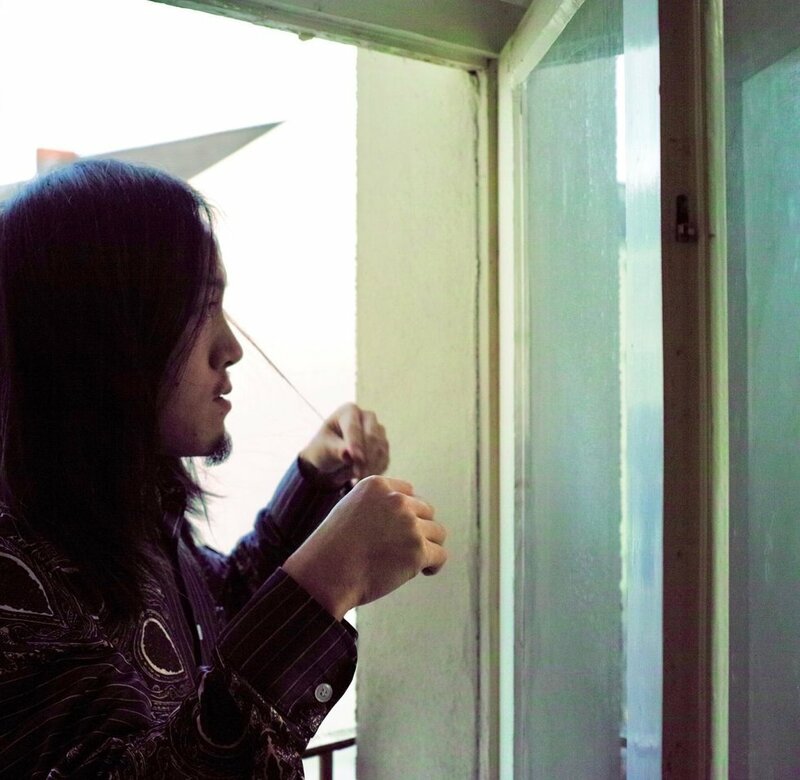 When we did our original recording session, I attached my SONY contact mic (the one not even made for the professional music use) onto some small instruments and non-instruments—kalimba, cardboard box played by brush stick, a small electric fan etc.—in Senju's room. I added some delay and loop effects with a Line 6 pedal while Senju played on an instrument, then we overdubbed it with different instruments in the same way, one by one. I mixed the tracks in early 2004, but I had zero knowledge about how to do the (more or less) proper mixing; it was just instinctual. Whole sessions were improvised, and the outcome was somehow rewarding. Using the contact mic as an audio microscope, while exploring sounds, you can lose yourself and get drawn in for hours. But we were basically just having fun. YARAYAWA at club Jazzhouse (now known as Alice cph). From left to right: Iku Sakan, Anders Lauge Meldgaard, Mads Forsby, Martin Hoshi Vognsen, Copenhagen, April 2017. Photo: unknown. 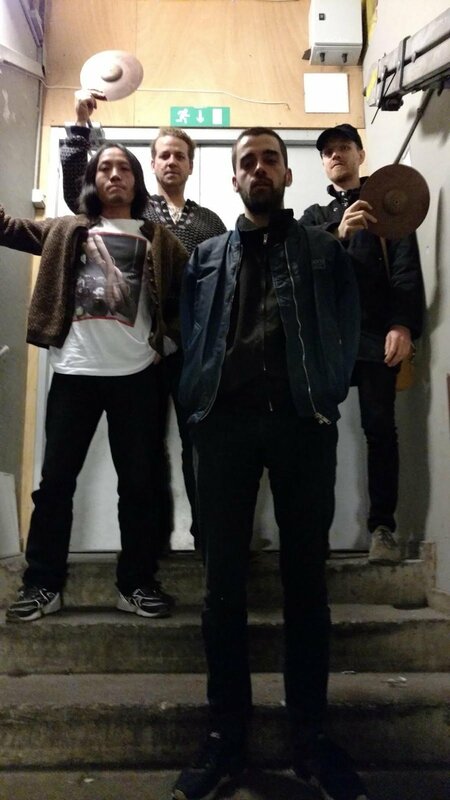 I have a band project called 'YARAYAWA' with three of my Danish brethren (Anders Lauge Meldgaard, Martin Hoshi Vognsen, and Mads Forsby). Musically, it's similar to Impulse! era Pharoah Sanders, to me at least: pure, elevated feelings with bursting expressions and melodic instrumentation. We recorded our rehearsal in Copenhagen last April with Anders' broken portable cassette tape recorder. The recording quality was beyond lo-fi but the music was flowing and beautiful. I'm not sure if we want to release this session, but it would be nice to put out a YARAYAWA record while we are still alive. It's a long-term goal. I also have an idea for an hour-long even piece. I got a story about this. Once (probably 15 years ago, or around the same timeframe that Senju and I did a Sakan & Senju record) I heard music in my dream. It was a string ensemble playing slow-moving, very melodic music, but it came with the sense of a circular rhythm. I ain't gonna lie, I literally woke up with tears in my eyes because the dream music was so beautiful and so moving. I've been thinking lately that I might be starting to get closer to realizing this dream music. Maybe it's time to start studying real composition technique, just like the late Stockhausen once told me. 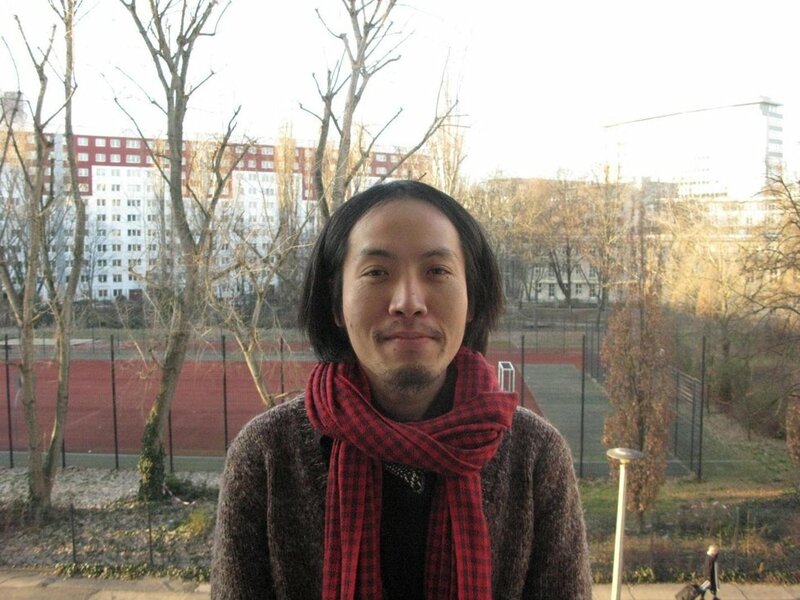 Iku Sakan enjoying a winter in Berlin, January 2017. Photo: Jeremy Coubrough.